While numerous randomized controlled trials have compared surgical treatments for cartilage defects of the knee, the comparative efficacy of these treatments is still poorly understood. The goal of this network meta-analysis was to synthesize these randomized data into a comprehensive model allowing pairwise comparisons of all treatment options and treatment rankings based on multiple measures of efficacy. We hypothesized that advanced chondral procedures would have improved outcomes when compared to microfracture. The MEDLINE, COCHRANE and EMBASE databases were searched systematically up to January 2015. The primary outcome was re-operation measured at 2, 5 and 10 years. Secondary outcomes included Tegner and Lysholm scores, the presence of hyaline cartilage on post-operative biopsy and graft hypertrophy. A random-effects network meta-analysis was performed, and the results are presented as odds ratios and mean differences with 95 % CIs. We ranked the comparative effects of all treatments with surface under the cumulative ranking probabilities. Nineteen RCT from 15 separate cohorts including 855 patients were eligible for inclusion. No differences were seen in re-operation rates at 2 years. At 5 years osteochondral autografts (OC Auto) had a lower re-operation rate than microfracture (OR 0.03, 95 % CI 0.00–0.49), and at 10 years OC Auto had a lower re-operation rate than microfracture (OR 0.34, 95 % CI 0.12–0.92), but a higher re-operation rate than second-generation ACI (OR 5.81, 95 % CI 2.33–14.47). No significant differences in Tegner or Lysholm scores were seen at 2 years. Functional outcome data at 5 and 10 years were not available. Hyaline repair tissue was more common with OC Auto (OR 16.13, 95 % CI 2.80–92.91) and 2nd generation ACI (OR 7.69, 95 % CI 1.17–50) than microfracture, though the clinical significance of this is unknown. Second-generation ACI (OR 0.12, 95 % CI 0.02–0.59) and MACI (OR 0.13, 95 % CI 0.03–0.59) had significantly lower rates of graft hypertrophy than first-generation ACI. Second-generation ACI, OC Auto and MACI were the highest ranked treatments (in order) when all outcome measures were included. 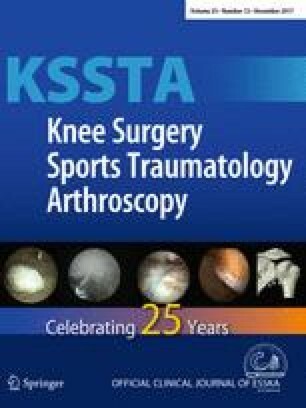 Microfracture and advanced cartilage repair techniques have similar re-operation rates and functional outcomes at 2 years. However, advanced repair techniques provide higher-quality repair tissue and might afford lower re-operation rates at 5 and 10 years. J.C.R. conceived the study, performed literature review, conducted all statistical analyses and prepared manuscript, figures and tables; G.L.C. performed literature review, extracted all data from source papers and prepared manuscript; B.J.C. and A.B.Y. conceived the study and edited and reviewed manuscript. Jonathan Riboh and Gregory Cvetanovich: None; Brian Cole: Aesculap/B.Braun: Research support, American Journal of Orthopedics: Editorial or governing board, American Orthopaedic Society for Sports Medicine: Board or committee member, American Shoulder and Elbow Surgeons: Board or committee member, Arthrex, Inc: IP royalties; Paid consultant; Research support, Arthroscopy: Editorial or governing board, Arthroscopy Association of North America: Board or committee member, Athletico: Other financial or material support, Carticept: Stock or stock Options, Cytori: Research support, DJ Orthopaedics: IP royalties, Elsevier Publishing: IP royalties, International Cartilage Repair Society: Board or committee member, Journal of Bone and Joint Surgery—American: Editorial or governing board, Journal of Shoulder and Elbow Surgery: Editorial or governing board, Journal of the American Academy of Orthopaedic Surgeons: Editorial or governing board, Medipost: Research support, National Institutes of Health (NIAMS & NICHD): Research support, Ossur: Other financial or material support, Regentis: Paid consultant; Stock or stock Options, Saunders/Mosby-Elsevier: Publishing royalties, financial or material support, SLACK Incorporated: Publishing royalties, financial or material support, Smith & Nephew: Other financial or material support, Tornier: Other financial or material support, Zimmer: Paid consultant; Research support; Adam Yanke: Arthrex, Inc: Research support, NuTech: Research support. As this was a meta analysis of published papers, no IRB approval. No patient consent was required. See Fig. 7 and Table 7.